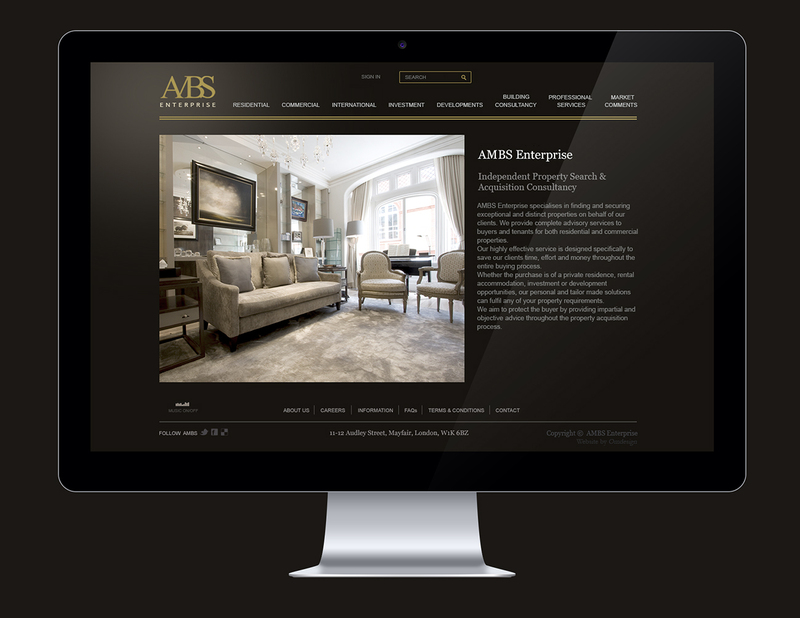 AMBS Enterprise is an independent property search and acquisition consultancy based in Mayfair. They specialise in finding exceptional and distinct properties for affluent clients both in the UK and abroad (mostly in Saudi Arabia) with a focus on properties in Mayfair, Knightsbridge, Kensington and Chelsea. The company provides a unique, bespoke service for clients who want to buy, rent or develop both residential and commercial property. The client wanted a clean, elegant, stylish website that would appeal to a target audience that was used to luxury. It needed to reflect AMBS Enterprise’s professionalism and commitment to the highest levels of service while at the same time being welcoming and easy to navigate. We decided on a minimalist, contemporary design that combined stylish colours with stunning photography to create a luxurious feel for the site. The client needs to update the photos and copy regularly so we developed a CMS using Django. This allowed us to include some highly personalised features and means that we can make changes on our end, quickly and easily, whenever the client needs us to. Key features of this estate agency website include: User-friendly, intuitive design which gives the site a professional look and feel and also ticks all the boxes for style and elegance. Web-based CMS which allows the client to update and change the content as and when they need to. An integrated language tool which displays content in Arabic, Chinese and Russian.